Mouse-over larger image to display more information. 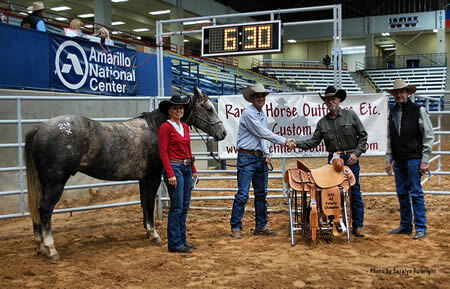 "Congratulations to Jeff Heaton and CS Real Sixshooter on winning the 2012 Headquarters Sale Futurity in Amarillo, TX. The purse was $13,000 and a handmade saddle. CS Real Sixshooter was purchased by Jeff at the 2011 Headquarters Sale held during the WRCA finals in Amarillo, TX."